Last fall I headed east to Bryan/College Station to stroll the Brazos County Master Gardeners’ tour. At the end of a solitary get-away-from-it-all drive down curving roads enfolded by majestic trees, I met such wonderful people and gardens! I wanted to move here ASAP. There’s a size and style to fit anyone, but all feature water-thrifty techniques and most include rain water collection. At the Master Gardener Demonstration Idea Garden, see how to plant for pollinators, grow organic vegetables and collect rainwater. 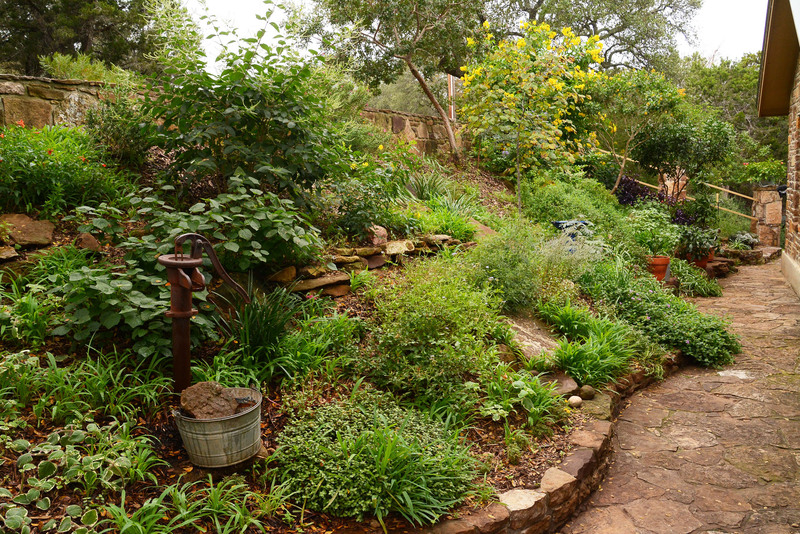 “Garden of Easing” is just that: a serene, low-care garden that features clever ideas like a drainage swale that directs water from front to back. “Sanctuary Rose Garden” is just as serene in its classic formal-friendly style. “Rescue Garden” pops with color in a very small yard, mainly with plants the gardeners rescued from “last chance” nursery tables. I’m impressed, since half-dead plants can be hard to resuscitate, but they’ve done it! “Wildlife Habitat and Garden” is a woodsy, perennial treasure where the house blends into the Certified Backyard Habitat. Daphne’s Plant of the Week, Xylosma, comes from Rebecca Schroeder, who gardens in Buda and blogs at Rebecca’s Retreat. This drought-tough, large shrub quickly screens for privacy or eyesore view. You can hedge it or shape into a small multi-trunked tree, as Rebecca did. Rebecca planted her Xylosma on limestone rocky soil in almost full sun. But it’s versatile about soils and can take shade, too. Root-hardy into the teens, find out more. On the opposite side of the size scale, container-sized succulents are almost no-care bundles of fascination for busy people on condo balconies or to accent a patio table or porch. Get John Dromgoole’s tips on how to plant and why shallow containers work best for tiny ones. Leafy irises and daylilies structure up water-thrifty gardens with bonus points for spring’s flowers. It’s not too late to divide them to promote flowering and pass along to other spots in your garden or a friend who really wants that color! Get Daphne’s tips on how to do it. Here’s what it looked like in June. We’ll look forward to her follow-up pictures next year! See more of Chris’s pictures. On tour, meet effervescent and energetic Velia-Sanchez Ruiz who scrapped most of her lawn for layers of perennials, annuals and herbs. I met Velia a few years ago when we taped, but couldn’t resist an encore visit in HD. Raising her children as a single mom while working full-time, her only “gardening” was pushing a lawn mower. When her girls hit their teens, one day she just dug in. Tackling one spot at a time, eventually she had her friend Jose Luis-Rosales build raised limestone beds. To stroll the interior garden—often visited by neighbors gathering serenity, along with handfuls of herbs and flowers—she laid decomposed granite paths. She scavenged the edging bricks. Velia mixes herbs into her borders to use in recipes and natural remedies. Mexican oregano is one of her favorites. To give her wrap-around beds a standout feature, Jose Luis-Rosales built an arbor for her La Virgin de Guadalupe statue—her tribute to a strong lady. Velia bought a cemetery-quality version to withstand weather. She gives La Virgin a warmer patina with splashes of Ironite now and then. She didn’t neglect the narrow strip on the corner side, where pollinators congregate as eagerly as neighbors on their daily walks. This Variegated Fritillary butterfly really wanted to hang out with our audio guy Robert Avila! At first, Velia never bought a plant, relying on pass-alongs from friends dividing their plants. Then, she attended an Austin Daylily Society show and sale one May, and was hooked! Now she’s a certified show judge and passing along plants and knowledge to new gardeners everywhere. Velia is one of the warmest, wittiest, and wise women I’ve ever met. That’s a lot of “w’s” but I’ll add one more: “Watch” now to meet her yourself.